Male, Black, 20-30 years, 5’08”-5’11” tall, 180 lbs., medium build, short black hair, black eyes. Clothing: black hooded Steelers sweatshirt. Male, Hispanic, 20-30 years, 5’08”-5’10” tall, 170 lbs., medium build, short black natural hair, black eyes. Tattoos: left and right forearm. 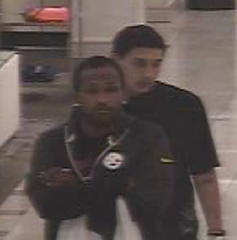 Synopsis: On 02/16/2017, the above suspects attempted to take items from Nordstrom without paying. The store’s loss prevention officer approached Suspect #1 and a struggle broke out. 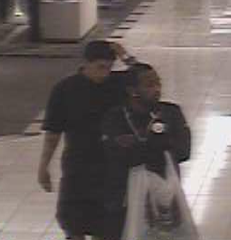 Suspect #2 saw the struggle between the loss prevention officer and his accomplice and he attempted to intervene. Suspect #2 pulled a knife out of his pocket and attempted to stab the loss prevention officer. The stolen items were recovered before both suspects fled in a maroon 2000-2005 Ford Mustang. Anyone with information on these suspects, please contact Detective Cpl. A. Silva at 714-245-8545 via email at asilva@santa-ana.org or Orange County Crime Stoppers at 1-855-TIP-OCCS.